Dr. W. Russell Callender has been named the director of Washington Sea Grant and joined the organization in September 2018. Callender emerged as the best person to lead Washington Sea Grant as a result of an advisory search committee’s deeply consultative process led by Amy Snover, director of the Climate Impacts Group within the University of Washington College of the Environment. Callender is a committed champion for coastal science and conservation and brings more than 25 years of experience in science, policy and management to the director position — including several years as the assistant director of the Virginia Sea Grant Program. 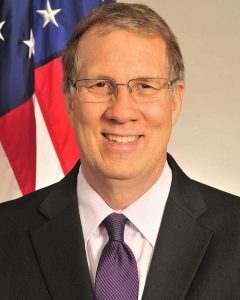 He has been at the National Oceanic and Atmospheric Administration (NOAA) for the past 18 years, most recently as the assistant administrator for NOAA’s National Ocean Service. In that role, Callender managed a yearly budget of $565 million and oversaw the work of more than 1,700 individuals at nearly 50 locations across the nation. He is adept at fostering successful partnerships at multiple levels and has become known as an effective and accomplished leader by building trust and ensuring accountability. As a result of his executive leadership and strategic vision, the National Ocean Service is a widely recognized, nationally relevant office that has strong bipartisan congressional support. Washington Sea Grant and the University of Washington College of the Environment are excited to work with Callender to continue to build the program’s capacity and reputation for delivering rich and rigorous research, technical expertise, and educational programming that supports our ocean and coastal communities and ecosystems. We welcome him to Washington State, the University of Washington, the College of the Environment and Washington Sea Grant.